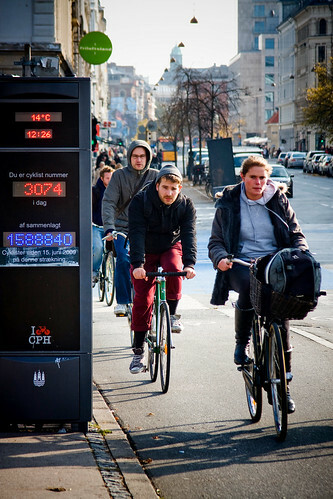 The cyclist counter on Nørrebrogade - the busiest bicycle street in the Western world. I was out on a little photo shoot the other day, taking photos of two of our cyclist counters in Copenhagen for the cover of the Dutch Cycling Federation's [Fietsersbond] membership magazine De Vogelvrije Fietser. 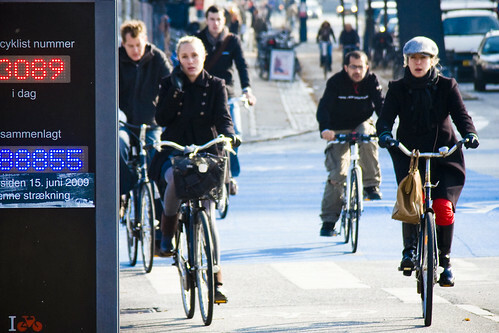 They were in Copenhagen recently to do a series of articles about the World's Cycling Capital. I've taken photos of the counters before, of course, but standing in both locations for a longer period of time it was really interesting to see how many cyclists actually look at the counter to see it register their passing. Even in the middle of a telephone conversation, at left above. Hans Christian Andersen Blvd. Cyclist 1,258,878 since May 1, 2009 on this side of the street. Now they serve a practical purpose, sending data to the Bicycle Office so they can track patterns in ridership at various times of day, in various kinds of weather, etc etc. But the counters are also meant to instill a kind of civic pride. Copenhagneners don't realise that what they do is exceptional and world-leading. They just get around town on their efficient transport tools. 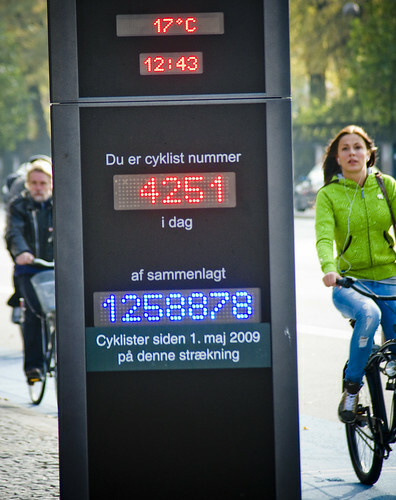 By displaying the extraordinary numbers for all to see, it is the hope that people will be encouraged to continue cycling and that others will join them. I've seen many pedestrians stop up and look at the numbers - locals who live in the neighbourhood and tourists alike - and express amazement at the stats. Civic pride is often a good thing and these counters are serving that purpose well. Cyclists 1,588,839 / 40 / 41 et al on Nørrebrogade since June 15, 2009 on this side of the street.